When political activist and National Patriotic Front member Jim Kunaka appeared before the Motlanthe Commission that is investigating the August 1 post-election violence, he did little to mask that he was out to act a script - and he acted it out badly. Kunaka ended up exposing himself not only as a witness that could not be relied on, but also inadvertently told us loads about his chequered political career as a thug. For those with knowledge of the political intricacies in Harare, he gave a good account of how he became a little godfather of violence in Zanu-PF commanding a shady outfit called Chipangano that died with his expulsion from Zanu-PF. Incidentally, Mbare today is free of terror because the command of violence by Kunaka was broken. Last July's election was peaceful and a relief to people of Mbare and surrounding areas because of the absence of Kunaka within Zanu-PF where it is emerging he used violence, terror, thuggery and corruption to his own selfish ends. Kunaka was the face and architect of Chipangano terror - and many media reports and personal accounts suggest so. Not least, he confirmed it himself before the Commission. In playing out his red herring - since he has been implicated alongside Shadreck Mashayamombe, another former Zanu-PF man and terror-related character -Kunaka's script was simple. First, he sought to delegitimise the Commission; and secondly, he was to spin an alternate set of "facts" that would counter the now emerging and credible narrative of an ugly opposition hand in both fomenting violence on August 1 and its role in the carnage and death of six people. On the first count, Kunaka went to great lengths in a bid to discredit one of the Commissioners - Professor Charity Manyeruke - by linking her to the Zanu-PF party and in the process making incredible claims that she had been his "commander" in violence. To cover up this slander, Kunaka asked, or rather threatened the Commission, not to allow Prof Manyeruke to ask any questions, least of all test his frivolous allegations. An excerpt of his testimony would be useful in dissecting his character. He said: "I was a provincial leader of ZANU-PF in Harare and I was in charge of commanding violent activities. If you check on the internet my name is there. Professor Charity Manyeruke, who is seated there in the Commission, is one of the architects of violence in ZANU-PF. She was one of the people with whom we would sit down to discuss how we would beat up MDC people." He also said: "Manyeruke was my boss who sent me to do violence and my commander who gave me instructions so I will not respond any questions from my commander because when we were in ZANU-PF I was merely her foot soldier." Kunaka took ownership of violence. His implication of Prof Manyeruke bordered on defamation. Even if one were to grant the association, it was immaterial to the ugly events of August 1. However, it appears Kunaka wanted to be the reply to Gabriel Chaibva, a former MDC member who recently gave a star performance before the Commission detailing the role of the MDC in urban terror and their likely involvement on August 1. Kunaka's reply was poor and bad in execution, as he paraded himself as a half-witted gun for hire whose account at the end of the day did not amount to much, save for its entertainment value. On the flip side, he did not absolve himself of suggestions that he was part of the August 1 terrorist activities which he is adept at, allegations anchored on the established knowledge that he is a former Zanu-PF man so keen on taking revenge on his erstwhile comrades. It has been noted that the worst carnage took place at Zanu-PF Harare provincial headquarters, where opposition vigilantes had previously not set foot, but could have been commandeered by the advent of Kunaka. Viewed from another angle, Kunaka's testimony could be read together with that of Paddington Japajapa, whose testimony before the Commission was equally full of sound and fury but had zero substance. The testimonies of the two men, along with that of Mashayamombe, served as a diversionary tactic. But it did not work, either. It is clear that the beneficiary of the testimonies is the MDC-Alliance leader Nelson Chamisa, who is seeking to shake off culpability for August 1. 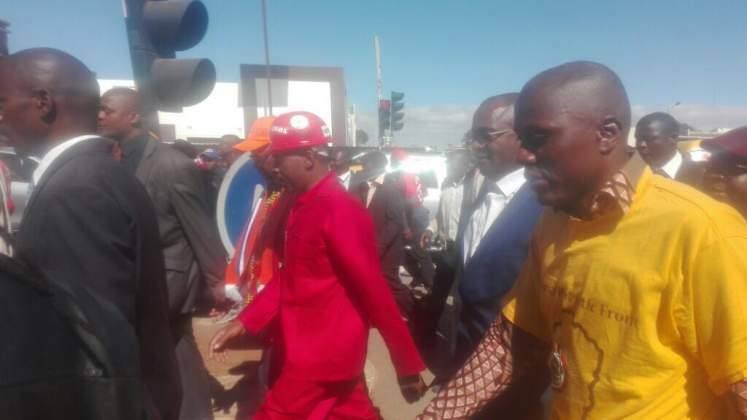 The violence and terror has been widely attributed to Mr Chamisa and his top leadership, including youth leader Happymore Chidziva and vice chair Tendai Biti, who called for violence and instability if their party did not win the July 30 elections. Those inflammatory statements have been recounted many times. Their calls for the MDC Alliance supporters to "defend the vote" - a codeword for causing mayhem through street protests - are also well recorded. Mr Chamisa has been anxious to swallow these words. A few days ago he attempted to distance himself from the violent protesters and the regrettable incidents of August one but he failed dismally. Not even when he said the people who took part in the violent demo in support of him were "stupid". He simply won't be able to hide from his agency. This also goes for the Kunaka show on Wednesday: it is not good enough to divert attention from a key witness in this matter when he appears before it.